As Fido has updated their $10 iPhone Value pack to include Name Display, Rogers has now also quietly introduced the change to its own iPhone Value packs. The iPhone 3.1 firmware update brought many new changes and updates to the iPhone but one of those changes was finally supporting Name Display. Many carrier plans include (some don’t!) features such as Caller Display and Name Display but what many people do not realize is that those two features are not the same. To summarize, Caller Display displays an incoming caller’s phone number while Name Display shows that caller’s name that they have on their account. This will occur even if the person who is calling is not in your iPhone contact list. 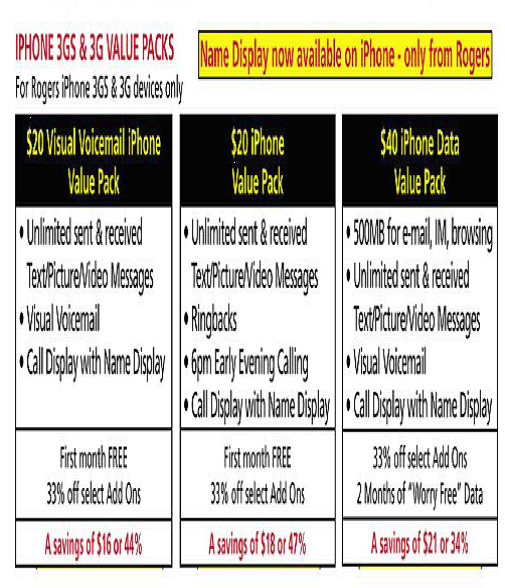 Well, effective November 3, 2009, Rogers has updated their two $20 iPhone Value packs and single $40 iPhone Data Value Pack to include Name Display. New customers of the value packs will have the feature enabled right away but existing customers will have to call Rogers and make the switch to the new value packs (same prices). Note: Use the above plan codes when calling Rogers because chances are Rogers reps will have NO idea what you are talking about. For older iPhone Value Pack owners, you should try to get Name Display added because you are entitled to it compared to similar non-iPhone Value Packs. Rogers will push back but make sure you push right back at them. For example, someone with an older $20 iPhone Value Pack that did not have Name Display can now call today and have Name Display added for free (same dollar amount for the Value Pack). But someone that has a $35 iPhone Value Pack, which was increased to $40 from $35 because of MMS, is also entitled to Name Display by simply looking at how $20 Value Pack customers get the feature for free by moving to the same $20 Value Pack but that it now has Name Display. Name Display has been around on all other non-iPhone value packs prior to this change today. Yet customers who have the $20 value pack with no Name Display can easily call and have their existing $20 value packs that are Name Display-less upgraded to the Name Display included Value Pack and the price would stay the same at $20. So there is no reason why the $35 pack should not get it for free as well. The cleanest option is to add Name Display as a standalone feature and receive a monthly credit for it. When you call Rogers, they will push back and play dumb, using gems such as “Name Display cannot be added alone”. Well, it can. The SOC code for Name Display on its own is “NAMEDPLY2” and it is $2.00/month (but Rogers won’t tell you that, instead they will try to make you upgrade your whole Value Pack). However, the first Rogers rep you speak with may not be able to provide a monthly credit for it, in which case, ask to move to Retentions and make your case there. Remember, be nice with Retentions and play the injured puppy role using ideas such as that you are paying more for your Value Pack than someone else that has a $20 pack for example and yet those cheaper Value Packs get Name Display for free by simply switching from $20 Value Pack to $20 Value Pack.